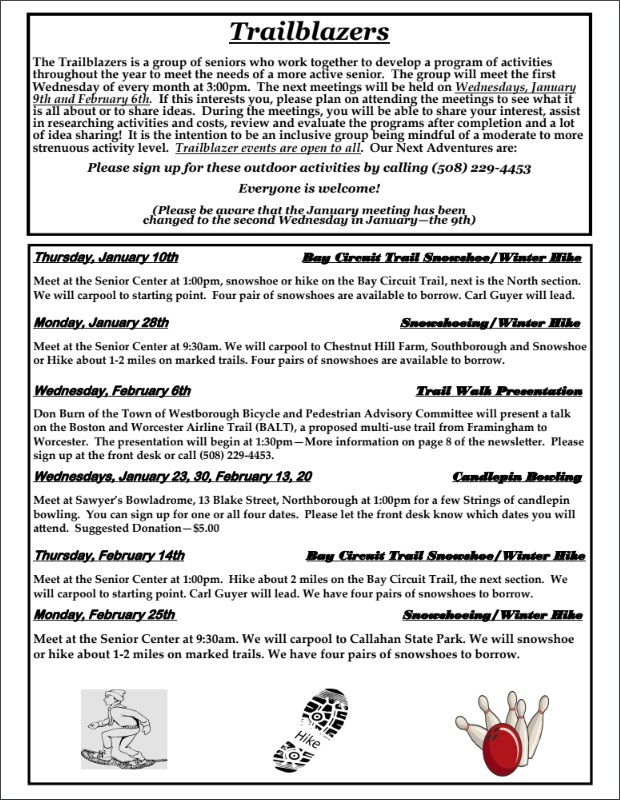 The Trailblazers have organized more events for active seniors this winter. Once again, they’ll be leading some snowshoeing/winter hikes on trails interspersed with indoor bowling fun. Unfortunately, I was missing the newsletter insert – so I missed sharing events earlier this month. Meet at the Senior Center at 9:30 am – about 1-2 miles on marked trails. Monday, February 25th – Callahan State Park. 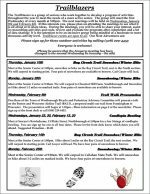 For all of these activities, please pre-register by calling 508-229-4453 or stopping by the Front Desk. The center has limited snowshoes to lend out for the events (2 women’s and 2 men’s). To find out if any are still available or sign up for any of the activities, call the front desk.